Cool off with fresh juice and smoothies! | Fat girl gone RAW! To add some protein and omega-3 fats, try adding two tablespoons of soaked chia seeds! I keep mine in a glass jar in the refrigerator – add two or three tablespoons of dry chia seeds and a few cups of water for a nice, gelatinous consistency. The chia seeds will absorb the moisture from the water, and not from your body – they blend up perfectly smooth and are flavorless. This mixture will keep in the ‘fridge for at least a week. 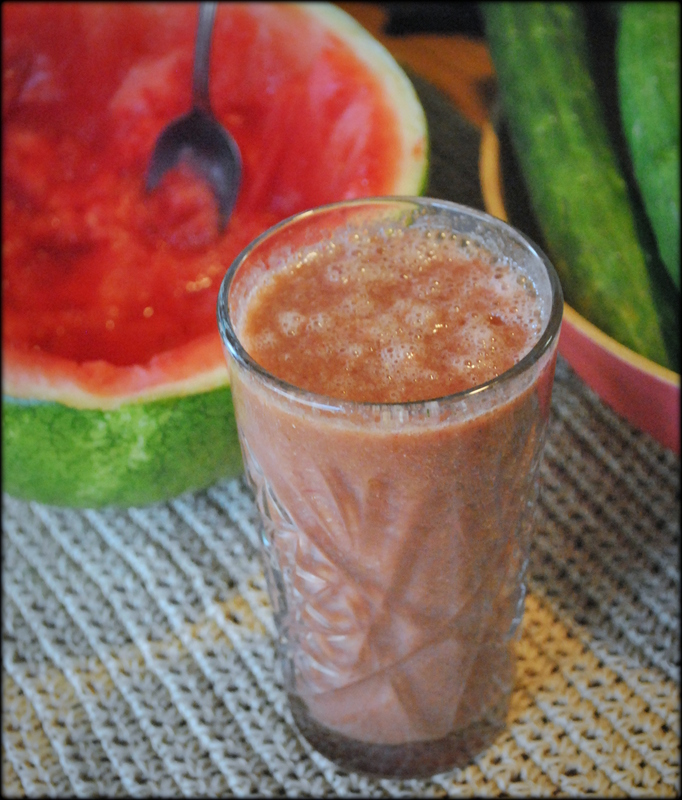 Put tea, mint, watermelon, cucumber and chia seeds (if using) into your blender. Blend on high until smooth. Add frozen strawberries and blend until well combined. Enjoy! 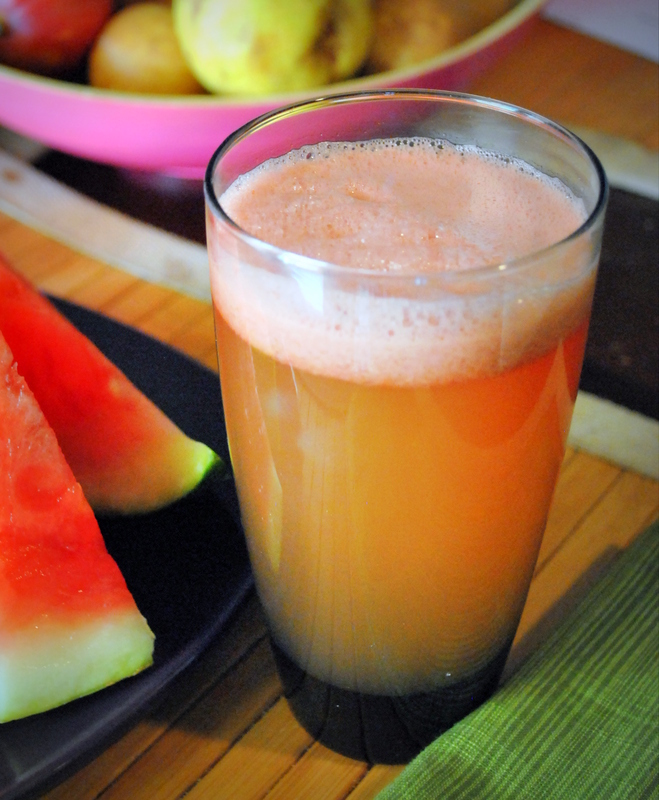 Run the watermelon and mint through your juicer. Add stevia, honey or agave to sweeten, if desired. I find that I like it without adding anything to it. 🙂 Enjoy! The last smoothie I created was a real treat. Just the night before I watched a video by my favorite raw foodist, Dara Dubinet. She made a peach smoothie, which looked so good. I decided to try one of my own. What came out of the blender when I finished was AH-mazing! I didn’t write down everything exactly, so you may have to play with the flavoring a little, but here is a rough draft of my creation. For this recipe, I used a Thai coconut, which I buy at Whole Foods for $2-3 each. I use a large kitchen knife to get into the coconut and use the water and fruit from inside to make this smoothie nice and creamy. These smoothies and juices are great for breakfast or for a quick snack throughout the day. When I’m feeling tired and need a pick-me-up, I find that spending a little time in the kitchen making a smoothie or juice gives me such a great feeling of satisfaction – not to mention the fact that I am creating something healthy and delicious! 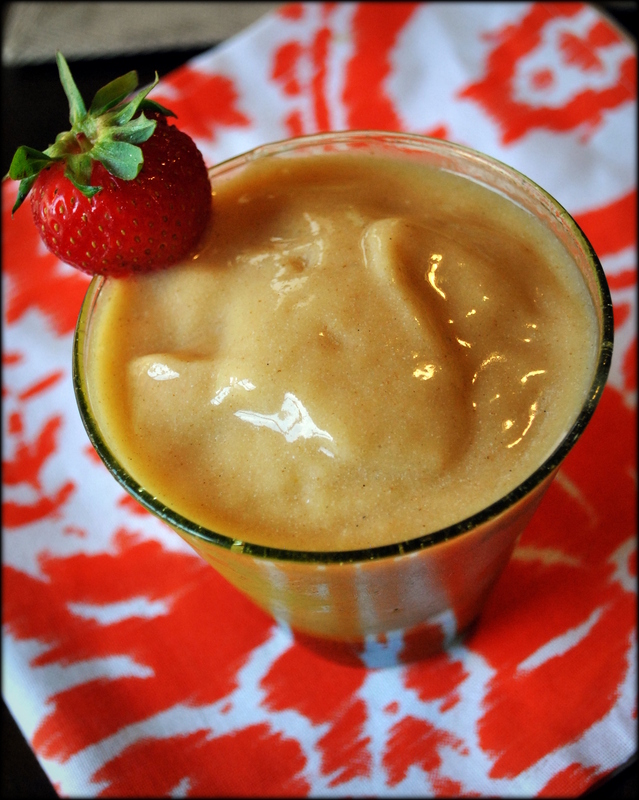 I hope that you’ll feel inspired to break out your blender or juicer and try one of these. I’ll also be posting another blog soon with recipes for my homemade raw CHOCOLATE smoothies and desserts. Stay tuned – and stay COOL!